Professor, dr. med. Kim Fleischer Michaelsen, received 1st of November 2017 ”Chr. IX og Dr. Louises honorary award” worthy of 100.000 DKK. It is the first time ever, the honorary award is awarded, and Kim Fleischer Michaelsen received the award for his year-long efforts within children nutrition research. 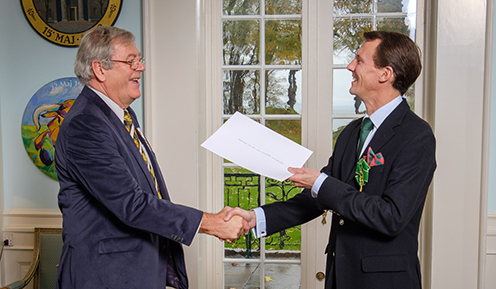 The award was handed over by HKH Prins Joachim in connection with a lunch at Sølyst in the Royal Copenhagen Shooting Society and the Danish Brotherhood. HKH Prins Joachim hands over the grant to Kim Fleischer Michaelsen. Foto: Søren Brissing. Professor Kim Fleischer Michaelsen has been an extraordinary active scientist. In 1997 he defended his thesis and in 1998 he was appointed professor in children nutrition at Department of Nutrition, Exercise and Sports at UCPH. At Department of Nutrition, Exercise and Sports he has built up and led the section "Children- and International Nutrition", which primarily deals with children nutrition in developed- and developing countries. Professor Kim F. Michaelsen has created a profiling research environment which has attracted many young and talented scientists. Today the department consists of four professors, three associated professors, five assistant profesors or postdoc’s and no less than 16 ph.d. students. With no less than 400 research articles published in international peer reviewed journals Professor Kim Fleischer Michaelsen has made international recognized efforts to enhance our understanding of the importance of nutrition when it young peoples' and childrens' development.